When I get an idea or concept in my head, I seem to see it show up in all sorts of interesting places. This story takes a few turns so be patient. The whole idea of community and creating community in our classrooms has been a very important theme in both my current class as well as the work I do in Prairie South. In reading Here Comes Everybody, Clay Shirky references the book Bowling Alone a few times so I figured I should buy it. Essentially the book deals with the decline of community in America and examines things like civic involvement, religious affiliation, and formal and informal groups. In essence, since the mid sixties, the social capital of Americans (I see Canada as having similar experiences) has declined quite dramatically. For many reasons, we are choosing to spend less time in community and more time as individuals, thus the title Bowling Alone. I read the first part of the book as I flew to Portland for ITSC. I had the opportunity to spend time with Tim Lauer and his family. They live in a very nice neighborhood and Portland in general has some wonderful neighborhoods. 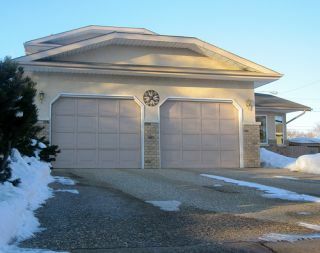 As I spoke about our current endeavor to build a new house I discussed our challenge to avoid building a "garagehouse". In many of our neighbourhoods lots are only 50 feet and thus people wanting a two car garage end up building homes that look like this. Fast forward to this week and I see a posting from Kim McGill showing Rich Farmer and a little change he's making in his classroom to encourage community. The point in Bowling Alone is that community gets eroded away slowly and before we know it we're operating in ways that make bringing community back very difficult. So, all that to say, if we believe community is valuable for our schools, what are we doing to make sure it happens? Is there something about the design, structure or regiments that would not make your school "neighbour friendly"?